Thomas “Tommy” Lee (1816-1900) was my wife Susan’s great-great grandfather who lived in southern Somerset County amid his wife’s Anabaptist families. Although long said to have been an Irish orphan adopted by Amish Bishop Benedict Miller, we now believe that his father, probably of the same name (b. 1780? ), had been somewhat older than Tommy’s mother and may have died before age 60, leaving his wife Catherine (b.1794) with 8 children. Thomas, Sr., used a middle initial, but it is illegible in the 1830 Census. So, I guess it depends on your definition of “orphan” whether Tommy qualified, but we might say more accurately that he was apprenticed by the kindly Amish minister, giving him many skills to survive in what was then the Pennsylvania mountain wilderness. Aside from leaving a large extended family, Thomas, Jr., or “Tommy” as we will call him, is perhaps best known as the maker of high quality spinning wheels, several of which are displayed at the Pennsylvania Historical Museum in Somerset, PA. This article provides some humorous stories and additional background on one of our talented ancestors and even some speculation as to his origins. Let’s begin by working backwards from the 1906 History of Bedford & Somerset Counties that reads, “Thomas [Tommy?] 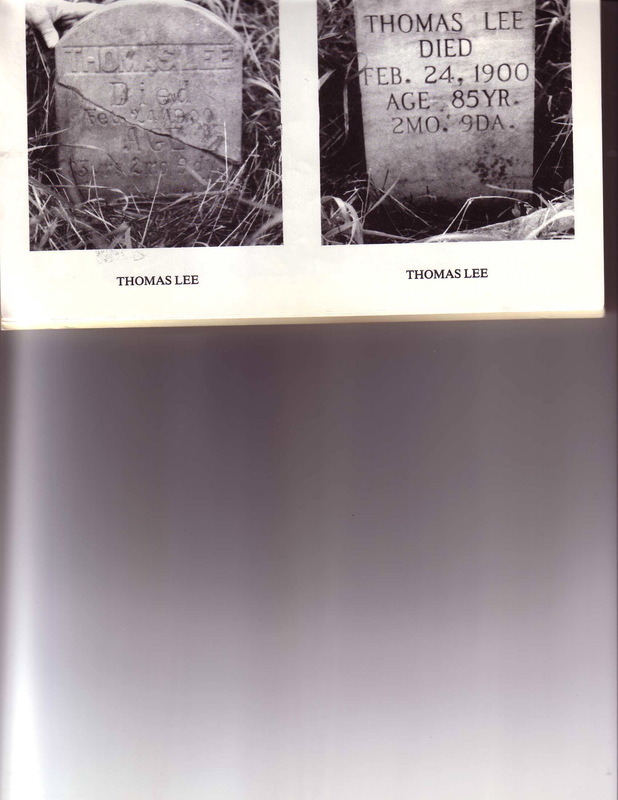 Lee was born in Milford Township.” Tradition suggests that our Lees came to Somerset County from down East in 1825, when “Tommy” would have been 9 years old. While there is a Milford Township in Somerset County, this may be a reference to Milford Township in Bucks County where a John Loe (Lee?) was reported farming adjacent to David Sellers and Henry Nase in 1798. Could this have been “Tommy’s” grandfather? In another article we’ll explore other Lees and similar sounding surnames in early eastern Pennsylvania, of various national origins and religions. A quick check of the Somerset County Censes shows no Lees here until after 1820. If our Lees were Irish, perhaps they originally moved in or near a small settlement of Irish immigrants called Paddytown in what is now Upper Turkeyfoot Township. “Paddy” is a nickname for the popular Irish name, Patrick. The patron saint of the Emerald Isle, Patrick has come to represent all Irishmen but can be derided by non-Irish, using the term “Paddy.” A Paddywagon has a negative connotation, insinuating that the police carriage hauls Irish criminals. In the 1830 Milford Township Census, Thomas, Sr., is recorded as age 50-60 and his wife was 30-40 with 6 children (2 males under age 5, 1 male 10-15 [no doubt “Tommy”], 1 male 15-20, and 3 females). Since the enumerator indicates 10 people in the household, who were the other 2? Relatives? Help? Thomas, Sr., is [probably] gone by the creation of the1840 Census. Son Joseph with wife and child are listed separately as remaining in Milford. He is the head of his household, but are they living on and/ or working the family farm? Probably. By this time mother Catherine (age 40-50) had moved to nearby Elk Lick Township with 9 in the house, and interestingly, 1 is recorded as “insane.” What is the extent of this disability? Could Thomas, Sr., still have been alive but had dementia? Did one of the older children have a mental handicap? Research indicates the use of another word, “idiotic,” another of 5 illnesses, medically undocumented and self-reported, including “maimed,” “blind,” and “deaf,” which precluded a mature person from being able to work on the day of the census enumeration. What “debts” could a “boy” have other than needing food, clothing, and shelter, or was he acting as head of mother Catherine’s household by that time? Family tradition continues after 1842, when Tommy married Elizabeth Brenneman (1816-1890), the daughter of Daniel and Maria Bender Brenneman. They moved to Addison Township, near the famous National Pike, now Rt. 40 and Interstate 68. Tommy is listed as a “wheelright.” Does this mean that the maker of fine spinning wheels also crafted buggy wheels? Probably, because the income from the former would have been limited while the latter would have been lucrative, especially along the well-traveled Pike and among the local Amish. The couple raised 6 children. First born, John T. (1843-1914), also maintained the Amish way of life and is remembered for having been gored to death by a bull at age 71. His descendants still meet regularly for reunions around the country. Tommy and Elizabeth were 42 years old when the last was born, Christian F. (1858-1906), Susan’s great grandfather. In 1869, the Lees moved back to Elk Lick Township. The Beers Atlas of 1876 shows the Thomas Lee farm in Elk Lick Township Had Tommy bought or inherited the farm? Our late uncle Clyde Krause copied an early deed from the Somerset County Court House that shows this property in Catharine’s name. We need to get a copy to determine the dates and transfers. The 1870 Census for Elk Lick Township lists Catherine as age 76, born in PA. “Tommy” is 53, and Christian is 13. Other of Catherine and Thomas, Sr.’s, children are married and spread around southern Somerset County. The location of Thomas, Sr., and Catherine’s graves is not known at this time. According to the Welfley history, Christian had completed his schooling by the age of 19 (1877). After helping his father and neighboring farmers, Christian “rented a farm from his father” in 1883 and purchased it one year later. Christian married a descendant of Hannes “Indian John” Miller, Sr., Laura Catherine Speicher in 1883, and they had 6 children. Daughter Annie was Susan’s Amish grandmother. Christian lived on the family farm until his death in 1906. The log cabin where Annie was born still stands on the late Bennie Yoder Amish farm in Summit Township, having been moved from the Elk Lick location. Thomas and Elizabeth are buried just over the hill at Niverton (see Photo Album: Lee), where he went to live after her death. While the Lee original family narrative requires some additional research to “fill in the cracks,” the news is both good and bad. On the one hand, plenty of written references are available in documents and publications at places such as the Somerset County Genealogical and Historical Society and the Springs, PA, Museum, the older Amish in our county are dying off and taking their stories and memories with them. Fortunately, the internet has made accessing research and graveyards much easier. You are invited to join the quest for new information, and when you do, please forward your findings to me so that I can share them with the multitude of “Tommy” Lee’s descendants around the world. Blackburn, E. Howard, and William H. Welfley. History of Bedford & Somerset Counties. Chicago: Lewis Pub. Co., 1906. Miller, J. Virgil. Anniversary History of the Family of John “Hannes” Miller, Sr. (ca 1730-1798). Morgantown, PA: Masthof Press, 1998. Miller, Olen L. and Alta Elizabeth Schrock. Joel B. Miller History. Scottdale, PA: Mennonite Publishing House, 1960. Lee, Levi and Elmina. John T. Lee and Elizabeth Yoder Family Record (1843-1985). Arthur, IL: Echo Printers, 1985. Somerset Co., PA, 1820-1880 Federal Census. Milford, Addison, Elk Lick Townships. 2004. 24 June 2010<http://www.us-census.org>. Do you have names of Tommy Lee’s siblings? Do you have ancestral names beyond Thomas Sr. & his mothers ancesters beyond Catherine Miller & her parents Michael & Mary Miller? An artical about Tommy & Elizabeth (Brenneman) Lee will be printed in the Casselman Valley Amish & Menn. historians this summer. Any information would be helpful. I have most of the land transfers including when Tommys mother Catherine (Miller) Lee got & sold the property near Comptons mill & it says where Catherine now resides. Hi! I am a Lee through my Grandmother Matilda. She is the daughter of Dan Lee, son of Noah, son of John T.
We have two family traditions as to where Thomas may have come from. The first tradition I ever heard about is a rather strange one. It goes like this. Thomas’ father was from Kentucky and suddenly found out that he was wanted for a murder. He decided to run as far as he could and left his family behind. He ended up in Delaware, where he started a second family. Later on he found out that he wasn’t wanted for the murder and returned to Kentucky, leaving the new family to fend for themselves. I have no clue as to whether or not this might be reality. The other tradition states that the Lee family was coming over from Ireland when the father somehow ended up in the ocean and died. Their mother then died while on the same voyage and was buried at sea. The tradition then goes on to state that the boys were farmed out to people near where the boat docked as they were orphans and that one of the boys was placed with the amish guy. I would be really interested in finding out if Tommy W. was really from KY. Has the 1810 or 20 census provided any clues of a Thomas Lee anywhere else that disappeared and then reappeared anywhere in the United States, specifically Kentucky? I need to do some research. We should pose that question to the Lee Family boards on Ancestry.com & Genealogy.com for a wider response because I haven’t done direct searches of those early censes, especially out on the frontier. Of course, I hadn’t heard the KY theory until you forwarded it. Please keep the interesting information coming. Has there been any DNA testing done on the Lee descendants? A quick Google search of Lee Family DNA shows nothing, but that would be an interesting possibility with such an interesting character. I’ll keep my eyes open. Thanks for suggesting the testing idea. According to the 1850 census Catherine was living with her son Joseph in Wharton Township, Fayette County, PA. I suspect Thomas W. was about 10-15 years younger than he said he was. There is a Thomas Lee listed in the 1810 census in Kentucky. The male head of the household is 16-25. There is a female 16-25. A female child 10-15 and male child under 10. I believe it is possible that our ancestor Thomas married extremely young. He may have run away with his girlfriend when they were really young. Based on that possible history it would not be far fetched to think he could have had a rocky life and thought he had killed a guy and then ran away and passed himself off as an older man. Good to hear from you again, Manfred. Still no confirmation at this end of your information, although I’m looking for Catherine’s grave and would welcome any new ideas. I’ll be going to the Grantsville Historians (MD) annual meeting soon and will inquire of the “experts.” Maenwhile, thanks for the info and please stay in touch. Hi, I just found a great big spinning wheel from the 1800’s. It has “T. Lee” on it in two places. Do you have any information on the wheels he made and how he signed them? Thank you. Thomas “Tommy” Lee was my wife’s great-great grandfather and constructed many such wheels, as I understand. Susan’s uncle inherited/bought several and donated them to the Somerset Historical Center before he died. They are on display there now. May I suggest that you contact Mark Ware, Director, with your questions: c-mware@pa.gov. I found this when Ancestry.com opened up the military records for free for just three days. Here is what the records said. I have transcribed this to the best of my abilities. Remarks: ???. ??? City of Washington, March 9, 1801. Appointed 2nd Leiut. 3rd Feb or Jan. Approved Feb 16, 1801. Present March 28th, 1801. Ordered to Fort or Port Adams, Maine (? ), ?ery., April 4/1801, Promoted to 1st Liut. May 21 or 29, 1801. Resigned March ? ?, 180?. Remarks: D. Ro. Feb? 16 and J. Ro. (E? )rie, Penn 8/15 present. M. R. Lieut. games brays (hard to read), Det(?). May ? ?/1?, present. Entitled to Sergenats pat to May 17/15. Discharged at ?hillieattre, Ohio., June 4 or 9/15. Term expired. See pension case. Third Thomas Lee, definitely not our ancestor. Remarks: D. Roll of colored men. Hello Admin, Larry Pearce; My name is Steve Nissley of Fishersville, VA.
Thomas, Jr., John T., Noah, Dan, Matilda, and myself, Manfred. I would be excited to help you make a movie! The weird thing is that I have a similar story about my ancestor, Christian Nissley, 6 generations back, in that he is believed to have been penniless off the ship from Germany and went home with an Amish man who paid his fare. He was supposedly 16. It is questionable as to him having had any Amish Background. My parents later met in Delaware where they had grown up, though dad was born in Kansas. I hope you’re kidding about the movie, although it would make a good one. Most of these old pioneer narratives would. Thanks for the update, and please stay in touch. We’re still trying to find the senior Thomas Lee, our mutual “stone wall” ancestor. Hmmm… I may have stumbled across something. There was a Thomas Lee in the War of 1812, married to a Catherine. Plot Twist: They hailed from South Carolina! I don’t know for certain that this is our Thomas, but the fact that Catherine was receiving his pension in 1871 is quite interesting! How many Thomas Lees were there that lived in the United States during the war of 1812, were married to a Catherine, and the Catherine lived to the 1870s? I always like to hear from you because you suggest such interesting things. In this case, I have my doubts: Thomas, Catherine, and Lee are such common names in history if the internet is accurate. Second, there has never been any reference to South Carolina among Tommy Lee’s adoptive community, the Amish, with whom we stay in touch. And finally, I haven’t heard that Catherine was living on a veteran’s pension, although she certainly could have lived to the advanced age you suggest. I’ll have to recheck my Census records. Thanks for staying in touch, and maybe some other readers have thoughts on the subject. You did mention that the 1870 census shows Catherine living to the age of 76. You’ve set me into looking again at records for Catherine. I see a Joseph with wife and child in Milford’s 1840 census. Who was this Joseph? Was their child Daniel? Too early for our Daniel (b. 1845), who had moved to Brothers Valley Twp. by 1880, probably with parents Thomas and Elizabeth. How/where does Catherine fit in? Stay tuned. Thanks for the inspirations to keep looking and asking. I have been reading with fascination your E-GEN page for Thomas “Tommy” Lee. I am not a Lee, but am related to many Lees through the Noah T Schrock family. Have you made any positive identification of Thomas Lee Sr, since the last posts on that page (3/19/2015)? Or come up with any more pointers? One of my Lee relatives had the impression that his Lee family was distantly related to Robert E Lee. Evidently this is just a legend? Now that is interesting info on Catherine! This is amazing. Has this information been confirmed, or is it speculation yet? The info on Catherine comes from Jim Yoder of Grantsville from public records. The info on Tommy’s father comes from his relative in Kansas as presented at the Casselman Historian’s meeting several years ago. I haven’t been able to confirm. Thanks for asking.